This Beachfront/Oceanfront 1500 sq. ft, 3 bedroom, 2 bath condo offers spectacular panoramic views of Banderas Bay and backs onto the verdant jungle of the Sierra Madre Mountain range. 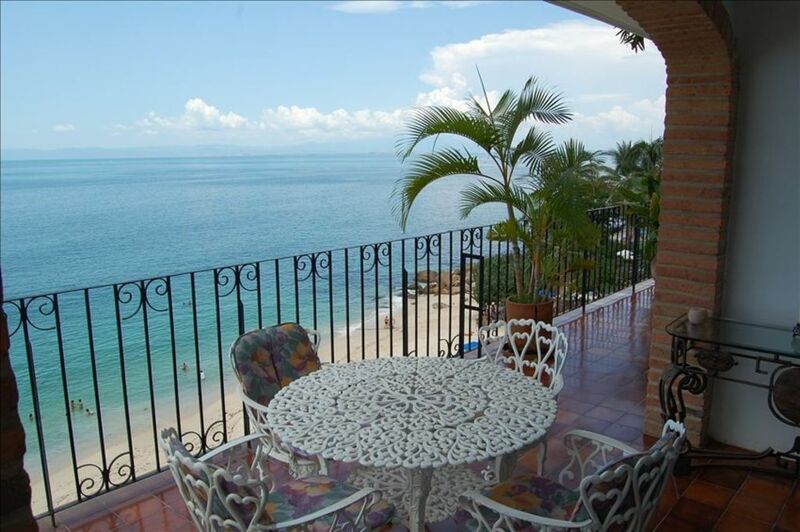 It is situated on the finest beach (away from crowds and vendors) in the Puerto Vallarta area, close to Mismaloya. Off the Master Bedroom is a balcony where you can greet the morning sun rising over the green hills with a delicious cappucino. A long balcony overlooks the ocean where you can watch dolphins at play or whales passing by during season. Nothing separates you from the white sandy beach other than the 3 inviting, heated swimming pools. These are child friendly with shallow ends and separated areas for the kids. There is also a shady kids' pool with a small waterfall. The exquisitely maintained grounds and gardens are rich with tropical trees, plants and flowers. There is a turtle sanctuary onsite with baby turtle releases at sunset during hatching season. Reception will call everyone to let them know when this is happening. There is a mini-mart next door for all your basic needs and well as a wonderful beach restaurant. Taxis are conveniently located and buses could not be easier, running every 10 minutes and will take you directly into town. This is a perfect location, away from the noise and the crowds but only 10 minutes from all the exciting restaurants, cafes, shops and galleries in the quaint town of Puerto Vallarta. There is very friendly and helpful 24 hr. reception (English speaking) as well as security 24/7. Friendly staff are ready to help with any of your questions or concerns. There is a library with private phone booths and very cheap int'l rates (eg: 20 cents USD/min to Canada and US). The library is also equipped with computers with internet connection or wi-fi for your laptop. There is a nominal charge for this. We have a washer/dryer in the condo as well. Please feel free to call with any questions and we wish you a wonderful time in PV! Be sure to take advantage of our restaurant grade margarita maker! Nothing is better than sipping your favourite drink while watching the amazing sunsets that Puerto Vallarta offers! Enjoy!! We chose to buy our condo at Playas Gemelas because it is the loveliest beach, with unarguably the finest sand in the whole PV area! It is so peaceful here, the waves are great for swimming and body surfing, the pools are delightful, there is never a crowd and we are so close to the 'action' of PV - just a quick 10 minutes away by bus or taxi. Many days we never leave our place as there are restaurants and a mini mart next door. We also found PV and area to be so safe. We feel more secure walking the streets of PV than we do in our own city of Calgary. Directly on white, fine sandy beach. Great for swimming. Amazing view of the entire Bay of Banderas and Los Arcos. Beautiful Tropical Garden adjacent to our building. Perfect for strolling. Cheryl Lee was a joy to rent from. I asked Cheryl for the actual address and she said everyone knows where the condo is. She’s right. From the airport to daily taxis, everyone knew where to go. The condo is well stocked with everything you could possibly need. More so than most places we’ve rented from. For the first few days we sat on the deck on watched whales swim by. We did a whale watch tour which was fun and saw many more. Went to the zoo one afternoon and was enjoyed by everyone. One of the reviews suggested Tony’s Hideaway, by the zoo for dinner. We ended up there twice. Great food. The men went bay fishing one day, didn’t catch anything but loved it. We typically enjoyed the pool and the beach during the day and then took a cab into PV for dinner. Cabs were always available at the condo. PV was crazy busy over the holidays so it was nice to go back to our quieter piece of paradise. Cheryl Lee was by far one of the best we’ve rented from. Thanks for sharing your condo with us. This is our 5th time back, some new updates, fans and new screens. It's a fabulous place to stay close to town but away from all the touristy places. Nice beach front and the property is always well maintained. The staff is always friendly and helpful. Chereyle Lee was concerned and contacted us because of the hurricane WILLA. She is always very accommodating. The accommodations were great. As nice as described. it met all expectations & more. The staff at Playas Gemmelas are great too. I hope to be able to go back next year. The condo is great. It has 3 nice bedrooms, 2 bathrooms, a family room, a dining area and 2 balconies. It is tight on the beach and there are 3 pools in the complex. It was nicely furnished with everything that we needed. There is a good restaurant and a mini market next door that had everything that we needed. There is a nice zoo nearby and the area where Night of the Iguana is just down the highway. My only recommendation would be to go there in the fall, spring or winter when it would be cooler. A minimum booking of 2 weeks is needed for Christmas holidays.